Details have been announced of the programme of talks, films, performance, exhibitions etc taking place as part of the Commemoration, Conflict & Conscience Festival. The main festival weekend is Saturday & Sunday 27th & 28th April but some exhibitions are on at venues across the city for a longer period and there are some linked events taking place before and after the weekend. 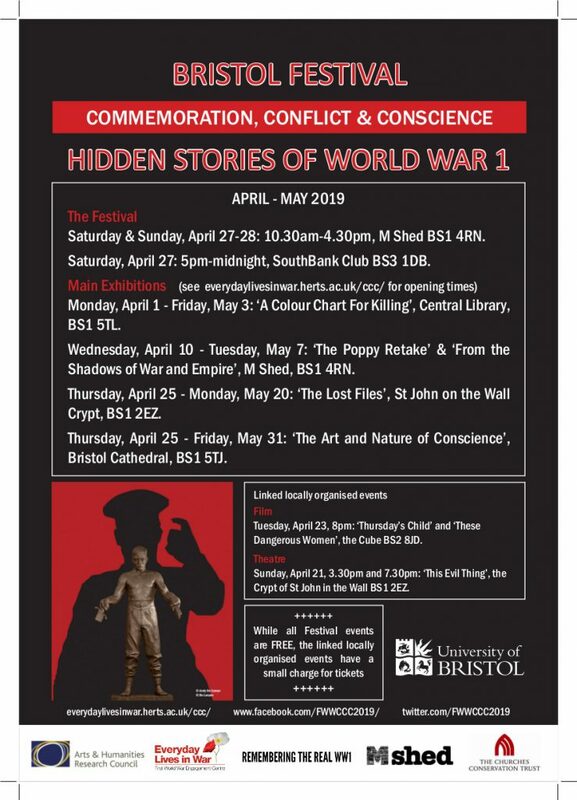 Commemoration, Conflict & Conscience is a national festival which looks at hidden or lesser known stories of the First World War, legacies of the conflict, peace-building and alternatives to officially sponsored commemoration. 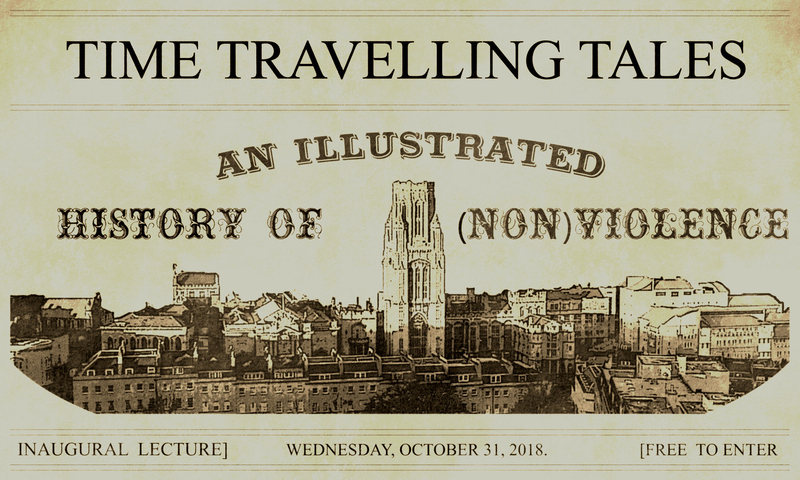 Topics considered include: the Shot at Dawn campaign; conscientious objection to military service; strikes; mutinies, desertion and absenteeism; colonial experiences and impacts; women’s peace activism; treatment of veterans; a century of opposition to war; alienation from commemoration. At Bristol’s M Shed museum, the weekend festival (27th-28th April) will bring together community groups, local historians, academics, campaigners, activists and performers from across the country. 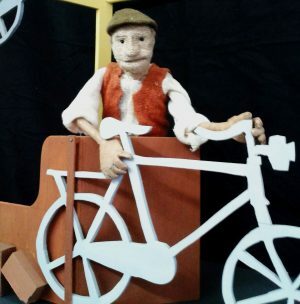 The festival includes exhibitions, performances, printing workshops, talks, films, song and music, community projects, a puppet walk and puppet show. More events are being added so keep looking at the web site. Organised by Remembering The Real World War 1 and linked to the Commemoration, Conflict and Conscience Festival, this film night is an opportunity to see two films about the part of women in opposing World War 1. Tickets can be booked via the Cube website here, although the title of the event on the web page doesn’t really fit the films! Best remembered as a suffragette, Sylvia Pankhurst was also a passionate supporter of the Russian revolution, a founder of the British Communist Party and a talented visual artist. Fighting for women to have the vote at the beginning of the century, she became a campaigner against colonialism in Africa after the Second World War. She dedicated her life to fighting oppression and injustice. Sylvia Pankhurst is played by Sharon Morgan and this programme, made for Channel Four, is presented by the late Professor Gwyn Alf Williams. It was directed by Michele Ryan who will take part in the Q and A following the screening. Drama/documentary made for Channel Four, directed by Michele Ryan and presented by Gwyn Williams. 50 minutes. Michele Ryan will be present for the Q and A. This screening is part of the Commemoration, Conflict and Conscience Festival. Chaired by Dr June Hannam. Anyone who saw Michael Mears’ one-man show ‘This Evil Thing’ in Bristol Cathedral in October 2017 will know what a powerful piece of theatre it is. We are now pleased to present two new performances, linked to the Commemoration, Conflict & Conscience festival at the end of April. The two performances take place on Sunday April 21st – Easter Sunday in the atmospheric surroundings of the crypt of St John the Baptist Church, one of Bristol’s oldest medieval buildings. The play brings together the stories of Bert Brocklesby, a schoolteacher and preacher at his Methodist chapel and Bertrand Russell,one of the greatest philosophers of his time. With the advent of military conscription their worlds are about to be turned upside down. Taking a Holiday tells the amazing story of the secret beneath a Bedminster bike shop. It is a story of struggle in wartime – full of intrigue, escapes, comradeship…and bikes. What does it mean to be a refugee and on the run in your own country? 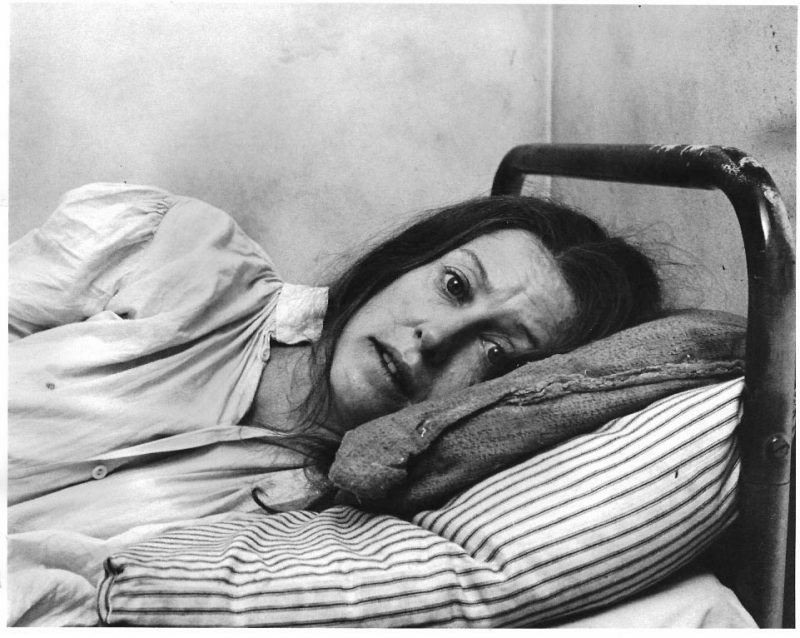 Who will give you a bed for the night, a job… or a means of escape? 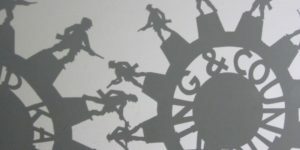 A tabletop and shadow puppet show based on the true stories of ordinary people in 1916/17, and the hidden history of the resistance to the war machine. 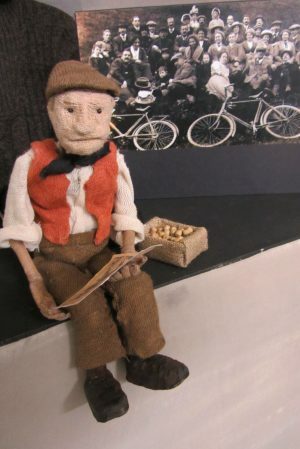 Do you want to help create a Puppet History Walk? Otherstory will be developing a Bedminster-based history walk with puppets, in Jan – March 2019. The walk will uncover the hidden histories of local people who resisted the First World War. It will take people round the actual locations where the war resisters lived, worked, met together and in some cases hid from the authorities. We’ll be using a mixture of puppetry, readings from historic texts, and songs from the period to bring their stories to life. The project is aimed at adults, and young people 14 and over. You can be involved in the whole project; or just come to one or two workshops, to do something you enjoy. This project is supported by the Heritage Lottery Fund and Arts Council England. 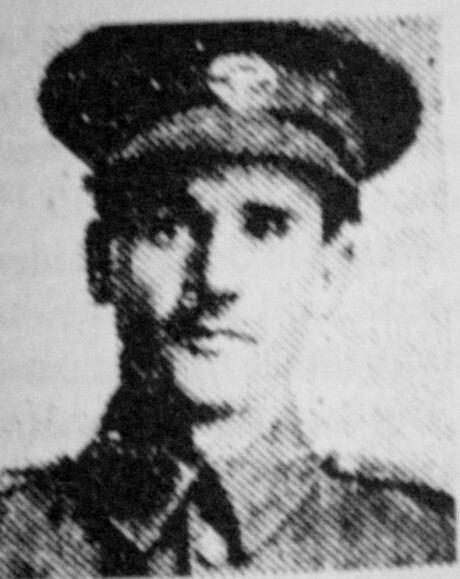 Alfred Jefferies was the only man from Bristol shot by the British Army for desertion in World War 1. 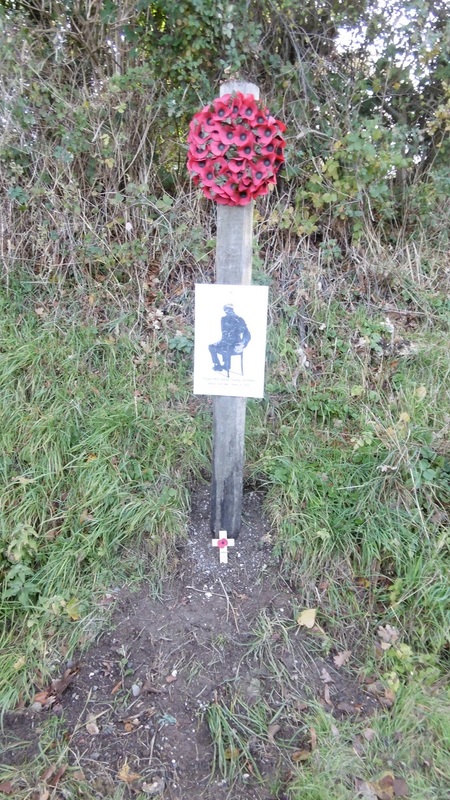 In November 2016, on the centenary of his execution, Bristol’s Remembering the Real World War 1 group laid a wreath in his memory in The Dings Park. The event was attended by local people as well as members of Alfred Jefferies’ family. It was widely covered by local media. See the story from the time on our website here. The story of Alfred (and his brother Arthur who died on the Somme in 1916) has now crossed to France. Alfred was shot in the village of Penin in the Pas de Calais region. Having heard of our event and the ‘Bristol Deserter’ pamphlet, on 1st November 2018 people of the village met to remember Alfred Jefferies themselves. David Jefferies, Alfred’s great-great nephew, and other family members were present. 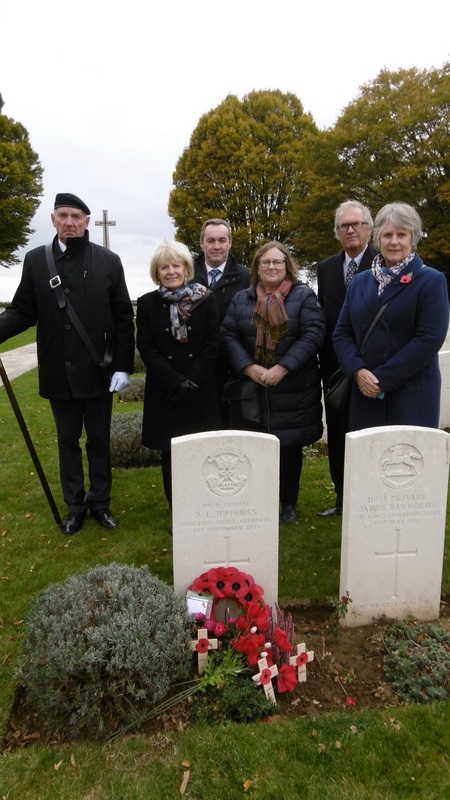 They then visited his grave in Arras cemetery. 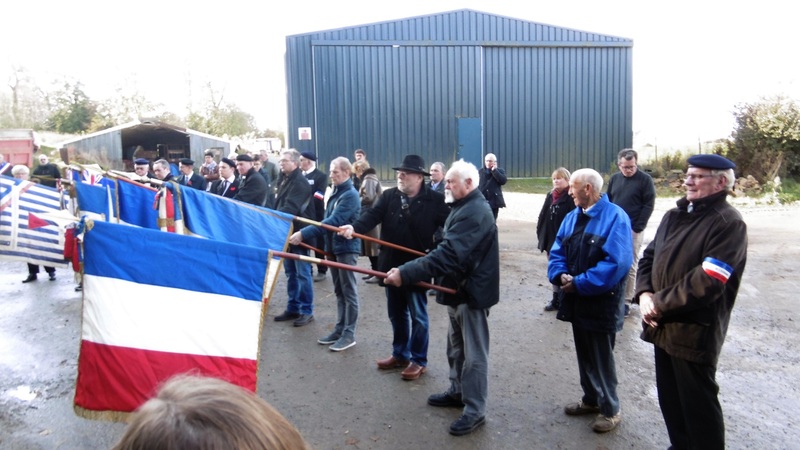 The commemoration was reported on local television in the Pas de Calais. In November 2018, Bristol’s local libraries are mounting displays to mark the end of World War 1 featuring local stories about the war. 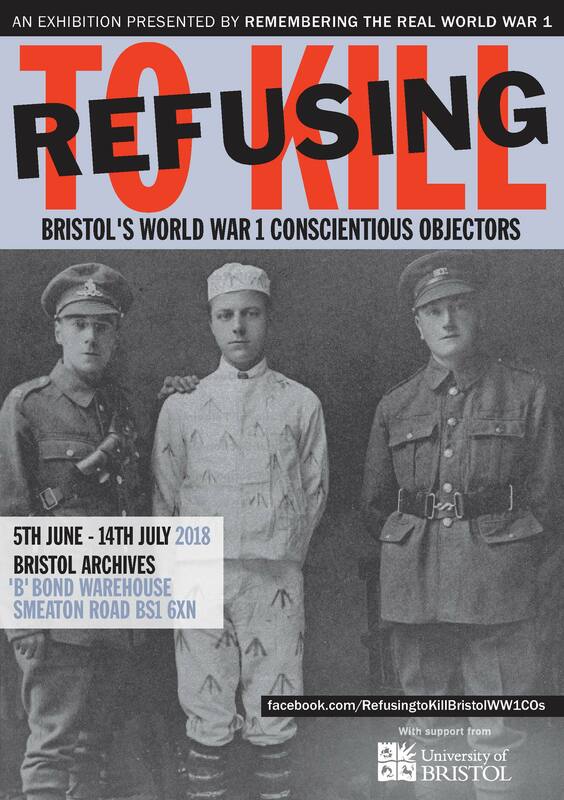 All but three of the libraries are including information about Bristol’s conscientious objectors.These displays will make sure that the story of Bristol’s COs will be seen by even more people across the city. Those without CO displays are Lockleaze, Henleaze & Whitchurch. Don’t forget to visit your local library in November and see their display. You can find details of Bristol’s local libraries including opening times on the City Council website here. Another Anti-War Film Goebbels Hated! Bristol’s Remembering The Real World War 1 group presents another classic German anti-war film at the Cube Cinema. Niemandsland (English title ‘Hell On Earth‘) was released in 1931. One of the first German ‘talkies’, the film was directed by Victor Trivas with a musical score by Hans Eisler, friend and collaborator of Bertholt Brecht. 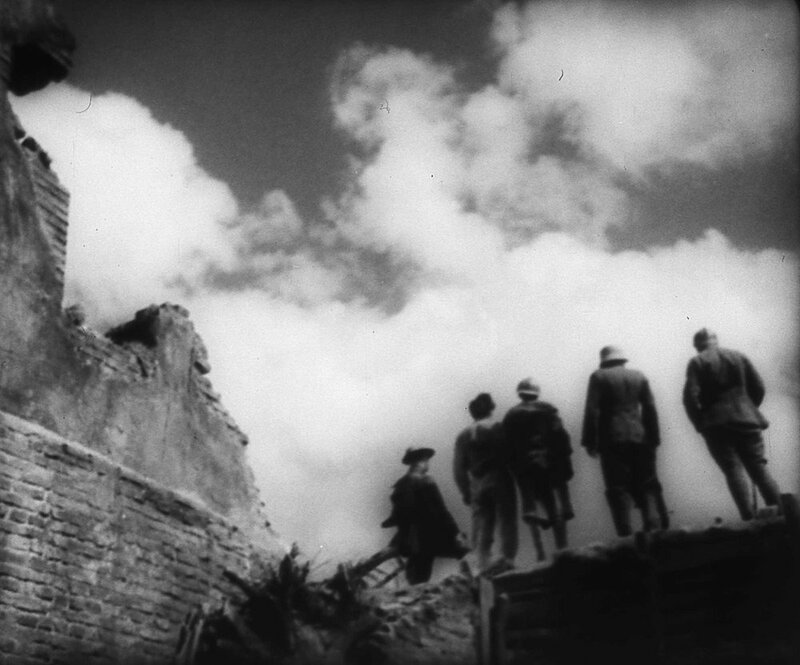 During World War One, five soldiers from different nations end up together amongst ruins in no man’s land and decide to stick together. One of the main characters was played by Lewis Douglas, a black American actor, and this made the film especially hateful to Nazi propagandist Joseph Goebbels who ordered every copy of the film to be destroyed. She will look at legal cases over different historical periods, including WW1. We understand the ‘Taking A Holiday’ puppets will make an appearance! This lecture is open to the public and entirely free. Please book in advance.. 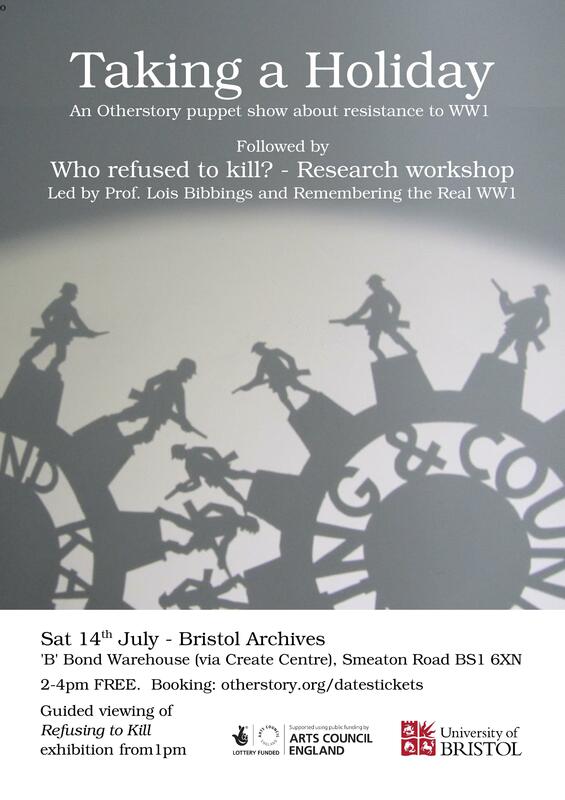 The ‘Refusing To Kill – Bristol’s World War 1 Conscientious Objectors‘ exhibition has been at Bristol Archives since June 5th. Just as when it was shown elsewhere in the city, it has attracted lots of interest. It runs until July 14th. While including much of the material displayed previously there is plenty that is new – both from local archives and CO relatives. See Bristol Archives website here for opening hours and how to get there. Saturday July 7th – 2pm – ‘Refusing To Kill‘, a talk linking the responses to World War 1 of Walter Ayles and Harry Patch. 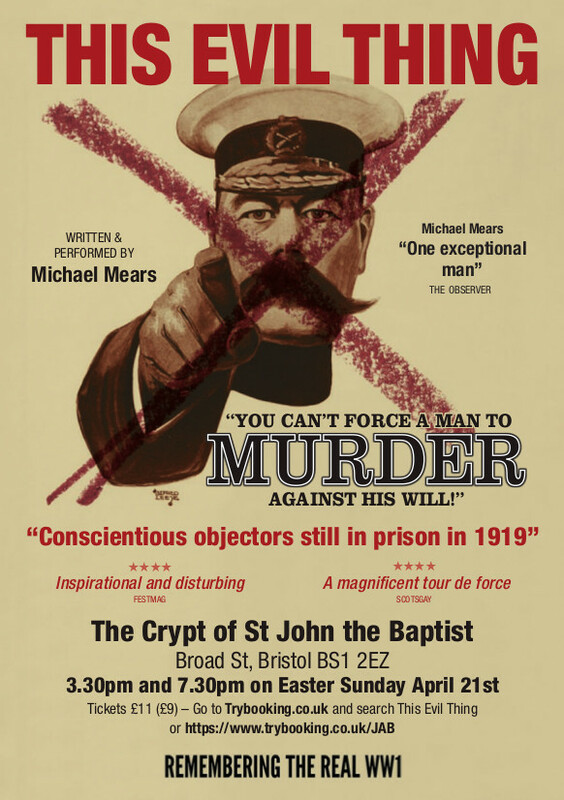 Walter Ayles, Bristol’s most prominent opponent of WW1, told his court-martial that ‘Slaughter Was No Remedy‘ before he was imprisoned as a conscientious objector; Harry Patch, the last surviving soldier to have fought in the WW1 trenches, said that ‘war was organised murder‘. This talk, illustrated with video, photographs and re-enactment will tell their stories. Speakers will be Lois Bibbings, Professor of Law, Gender & History at University of Bristol and local write and film-maker Colin Thomas. There will be a chance to see the exhibtion both before (come early!) and after the talk. In 1916, a man of conscription age who “took a holiday” was probably on the run from the military autorities. The show tells the amazing story of how a bike shop owner in Bedminster aided runaways who refused to kill. If you’ve seen an earlier version of this show you will know how good it is. Come again, the show has developed over recent weeks with plenty of new additions. 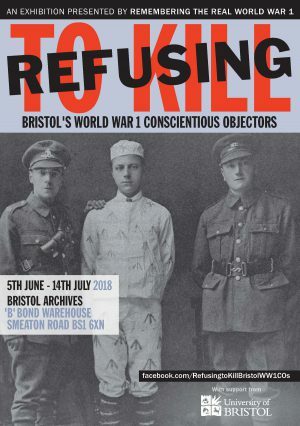 The exhibition ‘Refusing To Kill – Bristol’s World War 1 Conscientious Objectors‘ which was in Bristol Cathedral and the Central Library from September 2017 until February 2018 is in Bristol Archives from June 5th until July 14th. The exhibition tells the story of the almost 400 men from Bristol and the surrounding area who, for moral, religious or political reasons, refused to fight in World War 1. Alongside most of the material displayed previously, there will be new exhibits. These include documents and photographs from the Bristol Archives. We have met relatives of more conscientious objectors over recent months and we are also pleased to be able to display artefacts relating to several of them. If you have seen the exhibition previously, then there will be more to see. If you, or anyone you know, hasn’t seen it yet then this is your chance. Bristol Archives opening hours are on their website here.